Benefit from of a safe service in Thamesfield that has earned over 95% of positive feedback! Q: What makes the water-fed pole superior to other established cleaningtechniques? A: Unlike the classic ladder & sponge method, the water-fed pole allows the cleaners to reach panes from the safety of the ground. The expandable rod is 22 metres high and can easily reach even blemishes on the fourth storey of your property. Q: What other washing possibilities are are part of window cleaning Thamesfield? A: Besides providing industrious exterior window cleaning, the certified technicians can also ascend and clean any commercial skyscraper – a service named rope access window cleaning. Finally, the cleaning pros can also treat dust found on the interior side of your panes, and will bring ladders and squeegees to access hard to reach corners. Q: Why are there still water droplets on my panes even after you've removed all dirty marks? A: Our water has been purified from all naturally contained hard minerals. As a result, it will efficiently absorb all blemishes on its path and will vaporise under the sun without leaving residue marks of its own. Q: Does your service involve treatment of industrial premises? A: Yes, the Thamesfield window cleaners will arrive with the latest cleaning equipment to wash industrial buildings both small and elevated. The pros can also perform extra washing tasks, for example patio washing and gutter cleaning. A: Absolutely. The team's water-fed rod is attached to a special purified water storage inside the washing vehicle. In case the liquid has been used up, the experts will kindly ask you to supply them with any inside or outside water source. Q: Will I receive a compensation in case of any accidental property damage? A: Yes, all our services are comprehensively insured for your ease of mind. However, our washing technique is among the safest that you can find on the market and we'll make sure to wash your windows without leaving a single graze mark! With our window cleaning in Thamesfield, you get a proper clean of your sash windows, skylights, conservatory roofs, French doors, and other glass surfaces at fair rates. We will even offer a free wash of all PVC & UPVC frames and sills! For a full list of our prices, please view our price table below. With window cleaning in Thamesfield, we can increase the appeal of your premises even if it touches the clouds above. Let's review what you'll get once you schedule our custom-tailored service. For exterior window washing, the Thamesfield window cleaners will deploy a extendible water-fed rod. A water pump inside the specialists' van will pump filtered water up the hose and out of a brush-head extension. The water, in conjunction with the brush-head, will remove any traces of filth from the windows of any four-storey domain. With rope access window washing, the experts will use safe climbing tools to reach even the topmost storeys in your commersial or home property. We own all required COSHH documentation and risk assessment reports and can send them to you in a moment's notice. Moreover, we constantly check the washing gear to ensure that your booking will go without any complications. And to wipe every interior corner of your window façade, the skilled team will use the classic squeegee and ladder cleaning method. 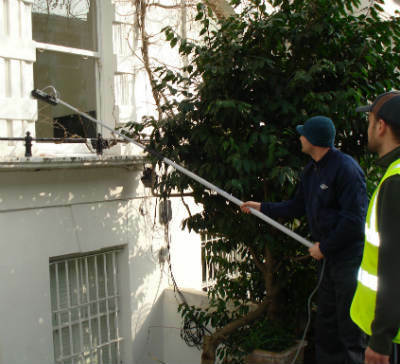 We are delighted to state that our window cleaning in Thamesfield has been booked by several adjacent areas as well. You can see which districts we operate in below. Another quick and easy way to get a free instant quote or to book window cleaning services Thamesfield SW15 is through our web site.